Not sure if this thread will get a lot of traffic, or be of general interest, but let's see. We have a half-share for the summer, so I'm spending a lot of time here. We actually have more like a 60-40 share and the other couple often cut their weeks short, so basically, yeah, I live here. It's been great, thus far. I've been vacationing here, about a week per year, since around 1988. There have been a lot of changes over the years, and of course, those changes have made some people happy, and others sad, even angry. I've been struck by how similar the town is to South Boston, which might sound a bit weird, but in regard to housing / development / gentrification, they're "suffering" the same problems. Oh, and of course, there are NIMBYs galore here, just like in Boston. In 2013, there were 2,964 residents in town, a significant drop from 2000, when it was up around 3,500. There has been steady drop in the number of children living in town; this trend sped up once they closed the local high school; students there are now bused to a regional high school. Even though the population has been decreasing, the number of housing units has been increasing, considerably, from ~3,800 to 4,300 units between 2000 - 2013. Much of this was new construction, although some of the jump may be from properties that used to be guesthouses that have been converted to condos. Even though the housing stock has increased, many of the homes remain vacant for long periods during the year, since they are being used as second / vacation homes. The Townie vs. Outsider lines have become more pronounced over the years. There's a good amount of resentment of "new arrivals", who are perceived as the ones responsible for higher housing costs, and also for destroying much of what made Provincetown special. In the summer, the population explodes, although I've found no hard data from which to quote. Estimates vary, with some saying as many as 60,000 people are in town at one time, including day tourists and overnight guests. The town is known for its diversity, although it's 88% white, 5% black, and another 5% two or more races, and even though its reputation is as a "gay/lesbian" community, "probable" gay people represent approximately 15% of its population. It's a liberal community, no surprise there. Hillary Clinton was here last week for a fundraiser, her first visit, and in line with her "new found love" of the gay/lesbian community. (She didn't come out in favor of marriage equality until after her earlier presidential run.) It's also a loud community - their town meetings are apparently quite a shitshow. It seems similar to me to other municipalities such as Berkeley, California and Cambridge, Massachusetts. Most people who visit here are probably oblivious to what goes on in the town when they're not here. On an urban planning note, I love the scale of Commercial Street. The group was formed as the result of a charette held in town last fall by the American Institute of Architect's Design and Resiliency Team (DART). It's a great variety of year-round residents, summer seasonal people, part-time residents, folks from other towns on the Cape, and people who just love Provincetown. I haven't been up to P-Town since I was a little kid. It's kind of a pain to get there... how is the Ferry for anyone who has taken it? Speed? Price? Does it serve alcohol? I have a great friend whose parents have a sprawling cottage in North Truro and I have been down to P-Town frequently as a result. Of course the fishing is amazing, the outer dunes have a wonderful Martian quality to them, the Pamet River watershed is breathtaking, and, as noted, Commercial St. has a great scale. We like to go karaoke at the Governor Bradford--a great "neutral" territory scene on Commercial St. But speaking of the Pamet River--given that it rises on the back side of Ballston Beach, during nor'easters, as folks may be aware, it floods so severely that it essentially severs North Truro and P-Town from the rest of the Cape. With rising sea levels, I anticipate this to become a semi-permanent crisis issue for the Outer Cape within my lifetime, with dire consequences for Provincetown. But maybe I'm being overly pessimistic? I've only been a P-town visitor since mid 2000s so cannot comment on the longer term trends but there is noticeably a flood of wealth into P-town, but exclusively summer residents. A few hotels/inns have been reno'd and are now high end (anyone miss The Ranch?). Blame it on Marc Jacobs. The summers seem more crowded with tourists in the past few years, visitors though I can't tell how many actually stay overnight (opposed to day trips from other parts of Cape or from Boston via Ferry). The art galleries, especially in the West End seem to be turning over rapidly. I spoke to a gallery owner a couple years ago and he said rents had begun to skyrocket and that many of the local artists were no longer local (moved to Northampton or Vermont as opposed to P-town, Truro, etc.). And I heard Joe's Coffee (somewhat of an institution/place to be seen or picked up) is closing. If true, that would be a real shakeup. Ptown still is a wonderful, unique place that I recommend everyone (whatever orientation) visit. I typically take the high speed ferry. It's definitely the way to travel though I have driven also during the off season. Very different than the Cape, in a good way. It actually has nightlife, restaurants and density that makes a car-free existence easy. A couple of the big circuit party weeks (4th July) may be too much for some but that adds to the fun. Real estate's gotten wildly expensive lately. At one point, my wife and I were planning to buy a cottage in town as a summer/retirement home. Now we'll be lucky to get a two bed condo. Fingers crossed for another financial collapse! In all seriousness though, it's hands down my favorite short trip from Boston. You can walk over to the ferry, have a drink and enjoy the view on the 90 min trip, walk to where ever you're staying, enjoy the beach, walk down commercial, get food, get some drinks, it's all great. I'm 100% not a crowds person, but you can avoid them if you know what you're doing. Even if you don't want to trek out to Race Point, the town beach is perfectly nice for sitting in the sand, taking a swim, and watching everything come and go in the harbor. It's a 24-condo development that includes 6 affordable units. 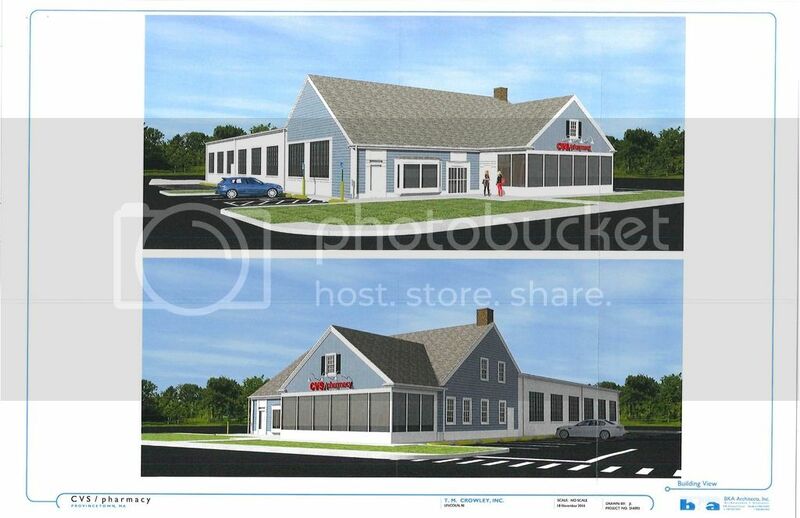 ^ The left side of this image is the original proposal, the right side is a sketch of an alternative exterior design the developer submitted to town. As-of-right they could build 9 units with a max height of 2-1/2 stories. I would see this development as NOT being controversial for people who might want more full time residents. “We know that we need 200 to 400 new units in the next nine years in accordance with our [Housing] Action Plan. So how can we make the claim that denying a 40B application is consistent with our needs?” asked Jarusiewicz. “Community housing, year-round housing at a variety of income levels, is desperately needed in town. We need to encourage developers and support their efforts in a way that fits the needs of the entire town. 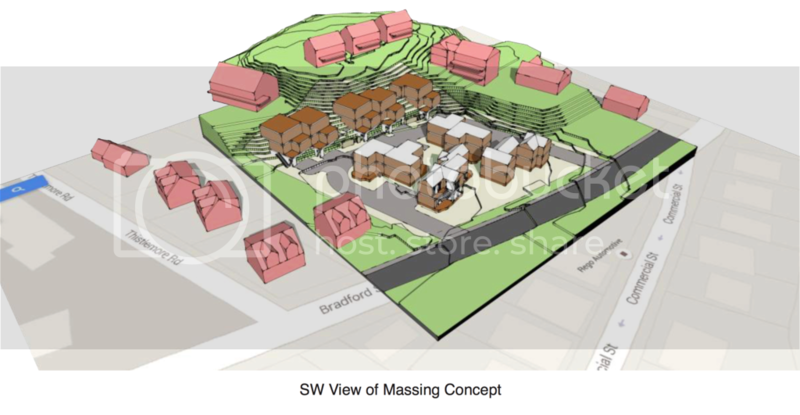 Residents have urged us to create housing scattered across town and not just in certain areas. This proposal does that,” she added. The 350 Bradford project was what prompted me to start this thread, so I'm glad you mentioned it. It's 24 units but you'd think it was 240, based on the hysterical responses from some people. The first and revised renderings are absolutely horrific, so the developer isn't doing himself any favors, but beyond that, the reaction is out of place. If you're not familiar with the town, take a look at the map linked above. The parking lot & restaurant on which the project would be built is at the very end of the road between Truro and Provincetown - it is, and will be, surrounded by trees. EDIT: And, the parking will be moved underground. And, it's across the street from an auto body shop. I don't disagree that abutters aren't right to challenge the proposal, but considering it was a restaurant with about 75 parking spaces and will now be 24 units, meaning probably 36-40 people will be living there, it's hard to criticize. Provincetown is attempting to face the housing affordability issue head-on, but if simple projects such as this one can't make it through the process successfully, there's little hope they'll be successful in the future. Images taken from David Dulnap's Building Provincetown web site, which is a treasure trove of information about structures in town. The 350 Bradford St. proposal 40B application was withdrawn by the developer. It's been scaled back to what he can build as of right -- 13 units (zero affordable). 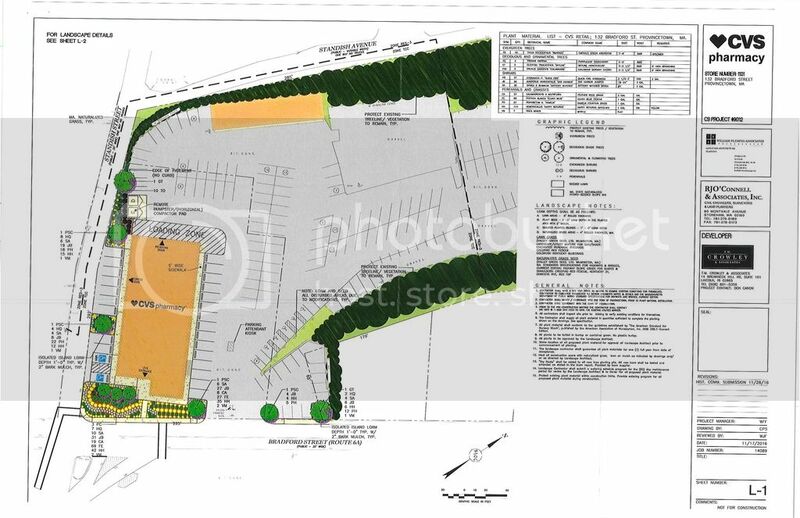 The developer is on the agenda of the town Planning Board for a work session discussion about the project on Dec 10. He also made it through Historic District Commission hearings and will be able to go ahead and demolish the existing restaurant building. Cabral's Wharf finally changes hands! Sold for $3.5 M to Charles & Ann Lagasse (Provincetown Marina LLC). The couple has built five full-service marinas in their hometown of Newburyport and own and manage several other marinas, including the Charlestown Marina and the Boston Yacht Haven Inn and Marina. Additionally, they manage the Fan Pier Marina in Boston’s Seaport District for the Fallon Co. It will be interesting to see how they engage the community and whether they keep the just-restored "They Also Face the Sea" portraits in place. It's a public pay parking lot that is owned by the same company as the CVS parcel. It's unclear whether CVS is leasing the building or purchasing it at this point.